Dogs never stop finding ways to have a good time, and KONG gives you and your best friend more fun per square inch than any toy on the planet. 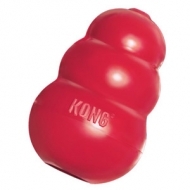 We’ve been making KONGs from our own proprietary, pet-safe, built-to-chew rubber ever since. Dogs love KONG. The way it bounces keeps them engaged and ready to play. It has a soft mouth feel for a satisfying chew and, of course, it’s super durable. Owners love KONG too; they can stuff it, throw it, leave it out in the yard — KONG keeps coming back for more.